Only three American cities are bigger than Houston, so it's safe to say there are more proposals and weddings here than almost anywhere else in the United States. With all of those engagements come lots of engagement rings, and technology makes it easier than ever to customize them. Engagement rings are a symbol of love and an investment in the future, but they're also everyday accessories that will be worn for decades to come. It makes sense to want every detail to be perfect and personal, but sometimes the sheer number of options can be overwhelming. It might help to seek inspiration from some of the city's most unique and popular custom engagement ring trends. "Halo" songstress Beyoncé hails from Houston, so it's fitting that so many local couples “put a ring on it” (as the Beyoncé lyric says) with custom engagement rings with halo settings, right? A single diamond surrounded by a ring of smaller diamonds is a classic and sophisticated choice for a modern bride, but lately the tradition has received a Texas-sized upgrade. 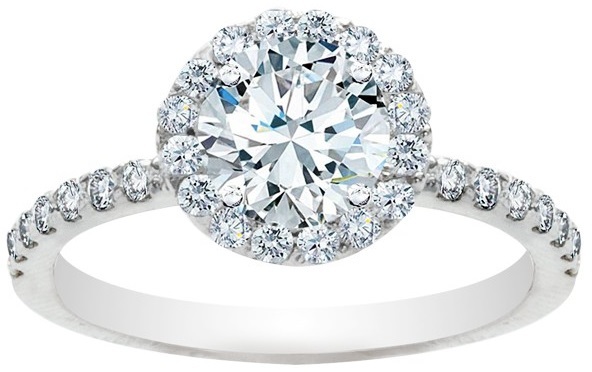 Lately, more and more women are sporting double or triple halos around their diamonds. The smaller the diamond centerpiece, the easier it is to surround it with multiple rows of smaller diamonds without creating too much bulk. The result is an interesting and unconventional engagement ring that resembles an art deco masterpiece. Angelic hoops might be this setting's namesake, but not all halos are round, so brides don't necessarily have to choose a round diamond if they want a halo setting. Angular stones, such as princess, emerald and cushion cut diamonds, can also be accentuated by borders of smaller diamonds. Three's company, especially for women who love the company of diamonds. Instead of sticking with a simple solitaire or accentuating one large diamond with several tinier ones, many Houston women prefer a brilliant trinity of three big diamonds on their ring finger. The center diamond is usually still the biggest, but its left and right neighbors can be as much as 75 percent of its size, creating a cluster of stones that adds bulk to long, slim fingers. Most three-stone custom engagement rings consist of three round diamonds. However, some women don't want the arrangement to take up the whole width of their finger, especially if they opt for a band full of pave diamonds that they want to show off. In order to keep it simple and small, choose an elongated shape, such as pear, oval or marquise, for the center diamond.